As those of you who read my blog know, I travel quite a bit for both work and fun. I am probably on 4-8 flights per month, if you count connections, and I spend quite a bit of time in hotels to boot. I've shared some tips for business travel before, but I figured this might be a topic worth revisiting, as I've got a couple more years of it under my belt. Overall, the tips in that previous post still hold true, and loyalty to an airline and hotel chain are still highly recommended if you want to reap any sort of perks and benefits. While all this jet-setting may sound glamorous, let me tell you this... you couldn't pay me to be a Diamond Platinum Adamantium frequent flyer or hotel points person, because those hard-core guys and gals are spending well over two months per year NOT at home in their own beds. They have definitely earned the perks! When you travel, you tend to be exposed to more sicknesses, dry skin, dehydration, muscle soreness from those tiny plane seats, overeating/feeling lethargic because you're eating out all the time, and overall exhaustion. And all the while, your closet is a pile of unwashed clothes because you're not home to wash them before jetting off again. It's not always the best thing ever, even though I end up loving the destination and have pretty pictures to show from it! Over time, I've learned to bring certain things with me to mimic the comforts of home, or even those of a spa. Nights alone in a hotel are the perfect time to pamper yourself a little bit! Even though I'll often stay up late working on homework or a presentation for the next day, you still have time to catch a little HGTV or take a bath. So I took a pouch from my closet and started adding little things, one at a time, then realized it might be worth sharing with you! 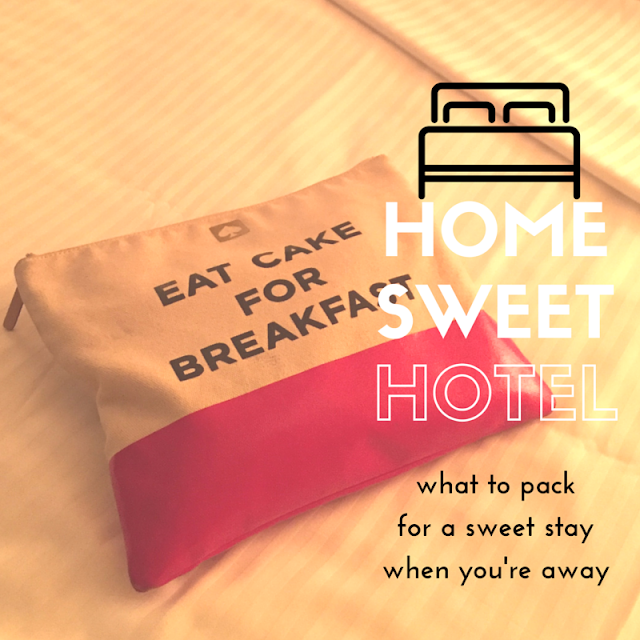 Here's what I've been packing lately in my "Home Sweet Hotel" pack as of late! All of these things fit nicely into my little pouch, and depending on the trip I take some or don't. It doesn't add much at all to my luggage, and it's nice to have things at my disposal. 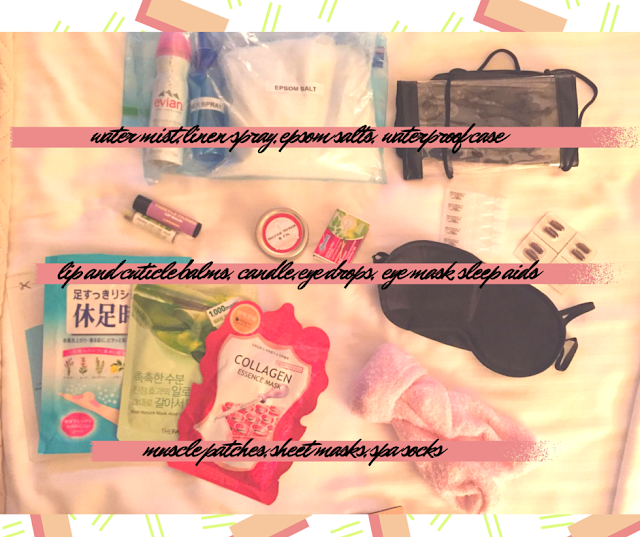 Sheet masks in particular are easy to pack and perfect pampering. Two other things I recommend if you're traveling to another city... Check to see if you have any friends you can meet up with (why not?) and pick some kind of local site or restaurant to experience. If I'm traveling for work, my plane ticket is paid for, so why not grab a drink or dinner if you don't have work requirements after the day is done? Or see something that the city is famous for? I love visiting museums, hunting for the best local donut, things like that! 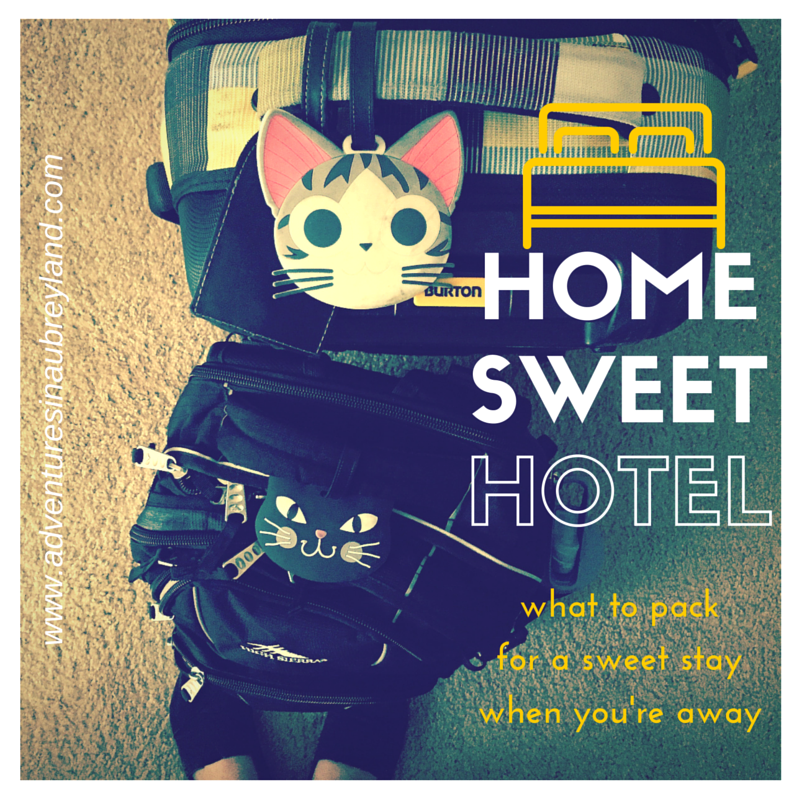 Any business travelers out there have other tricks of the trade to share?